Gold is priced in US dollar, so the price of gold usually moves opposite (inverse correlation) to the value of the US dollar. The charts below show gold´s cash price in upper window and the US dollar index in the lower window. Price of gold has been in a range since the start of 2017, as can be seen in the first weekly chart. 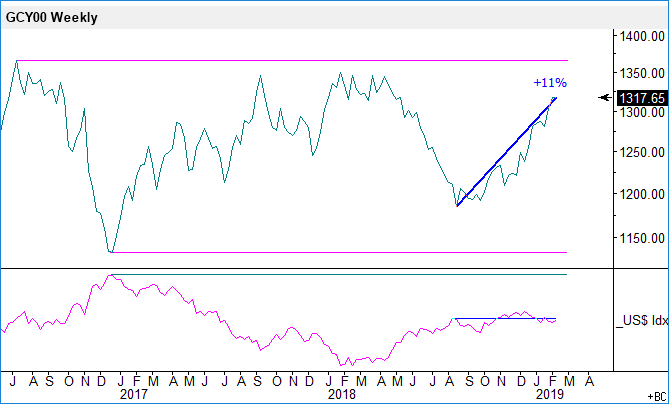 The second chart shows more clearly the latest gold price rally, which is promising for gold bulls. Why? 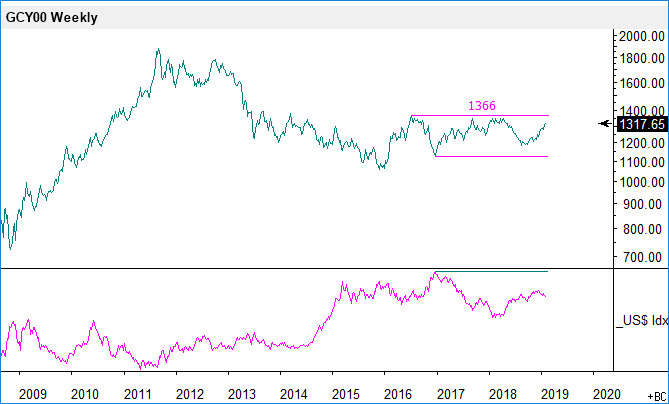 Because while price of gold is up 11% from its August 2018 low, the move in the US dollar index is essentially flat over the same period - suggesting the up move in gold´s price is not barely due to dollar weakness. However, if the dollar weakens from here, the price of gold could rise further and perhaps break above the range.